The "You Got It" campaign features an online video and other media. 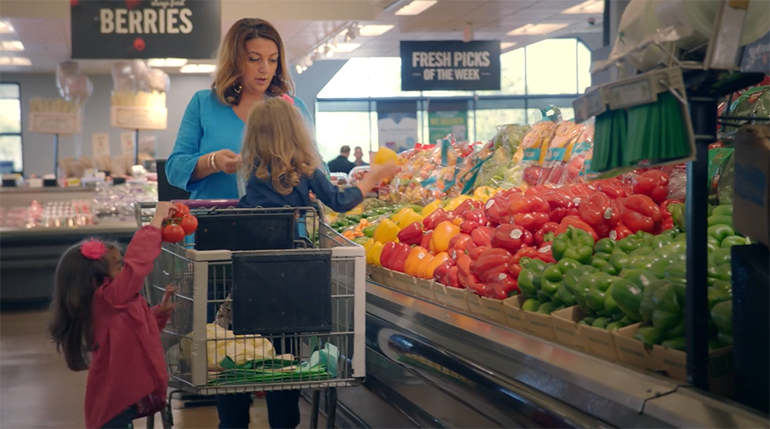 Stop & Shop is supporting the launch of a major store refresh program with an advertising campaign reflecting the chain’s customer-centric strategy. Called “You Got It,” the campaign takes a real-people approach in showing how Stop & Shop helps on-the-go customers navigate their daily routines so they could spend more time with their families. The documentary-style campaign, developed by Boston-based ad agency C Space, kicked off on television, radio, online video and out-of-home media on Friday in Connecticut and on Monday in Massachusetts, Rhode Island and New York. To capture the “real customer” viewpoint, C Space used its "empathy engine" tool that includes a community of several hundred Stop & Shop customers available 24/7 to provide their opinions and insights. "We wanted to connect directly with our customers in a meaningful way with this campaign and to let them know that we really understand and care about them," according to Whitney Hardy, senior vice president and chief marketing officer for Quincy, Mass.-based Stop & Shop, part of Ahold Delhaize USA. "Our customers are at the core of the change that's under way at Stop & Shop. Everything we're doing from our creative to new in-store features is centered around making things easier for them so that they can enjoy what matters most." The companies said the campaign leverages consumer intelligence from Stop & Shop’s own research along with learnings from C Space, which specializes in customer relationship-building. "Stop & Shop wanted to do something unexpected. We're not an ad agency. We're a customer agency. Real life is what we do best. So that's what we gave them," commented Franco Bonadio, chief creative officer at C Space. "We believe that the customer experience encompasses everything, from in-store to ads. Stop & Shop is forging an emotional connection with their customers by choosing to partner directly with them as opposed to advertising at them." On Oct. 5, Stop & Shop introduced a new brand concept and format at 21 stores in greater Hartford, Conn. The launch marked the start of a $70 million, multiyear store upgrade program at the supermarket chain’s 400-plus locations across the Northeast. President Mark McGowan noted in announcing the plan that Stop & Shop is reshaping its store experience around the customer. “We recognize that our customer is changing, and we’re evolving our entire shopping experience to better serve them. They’re focused on getting back to their lives, juggling many responsibilities, and we want to make grocery shopping even easier and faster for them,” he stated.